Parliament is back in session, and today was the throne speech. The minority government looks like they are going to attempt to restart the economy with a deficit spending spree. Tomorrow is the official budget speech, but the NDP have already stated with will vote against the budget, freakin' morons. Liberals and the Bloc Quebecios are taking a wait and see attitude. If the opposition vote against the budget, well, either we will end up with an election, or possibly, God forbid, a coallition government. The next couple days will tell. Gracie, my beautiful 13-year-old shepherd/collie mix, has found her purpose. Six years ago, when I came home from a Boston hospital after my spinal cord injury, I was wearing a huge rock-solid brace that went from my chin to the middle of my chest. When my husband Bob helped me to our couch, Gracie hopped up to give me her usual 3 million "Yippee you're home!" kisses. But before she landed her sloppy tongue on my face, she abruptly stopped herself upon seeing my brace and, I believe, sensing my pain. And in that instant, I was no longer her caregiver. I was in her care. Ever since then, Gracie's reason-to-be has been to watch over me. Although she's nearly deaf now, she feels the vibration on the floor when I get out of bed. She rouses herself from her heated doggie bed. As I head to the bathroom, she leads the way as if saying, "I'll protect you, Mom. Just stay behind me." If there is anythingsuch as a slipper in my path, she will come to a stop, turn sideways to block me, and then wait until she's sure I've seen the obstacle. Lately, I've been re-learning how to walk. And just recently I made my first trek to walk with her at her favorite spot - a woodland path around a pond. I used to walk there with her every day . . . before. down, she tried her best to walk a straight line, but she couldn't. ed as if granted a second life, she became happy and purposeful in her ever-vigilant new role as "Grand Protector of My Mom." If another dog jumps up to greet me, I fall. So, on that second day, a dog about 30 pounds bigger and many years younger than Gracie raced in my direction. Gracie, barking, "I'll get him!" moved as fast as she could to shield me. She planted her old, weak body right in front of me as a barrier. She faced the large, spirited dog. Then she barked a loud warning, "You better stay away from my mom!" The dog tried to get around her to reach me. Gracie growled, which I have not seen her do in over 10 years, "I mean it!" The dog backed off. Gracie has taken on 4 dogs at once, to stop them from getting to me. You see, she has shown me something I had not known before. Gracie would give up her life for me. A verse from the song "Mr. Bojangles" haunts me. how his dog and him just traveled about. His dog up and died. Today, I said to my wise reverend friend Connie, "Do you think that having Gracie is worth the pain of losing her?" Connie said, "Oh yes. Your sadness is so deep only because your love is so deep. What is a life without love?" And so, I knelt on the floor next to my Gracie. "Thank you for taking care of me - for protecting me from all of the evils you think could ever come my way." I rubbed her bony hips and shoulders. "You have done a great job." I kissed her golden forehead. "I will always love you." She sighed, then fell asleep, tired from a long day of watching over me. I whispered so as not to wake her, "You are my true friend." A number of years back there was a great cartoon Calvin and Hobbes. 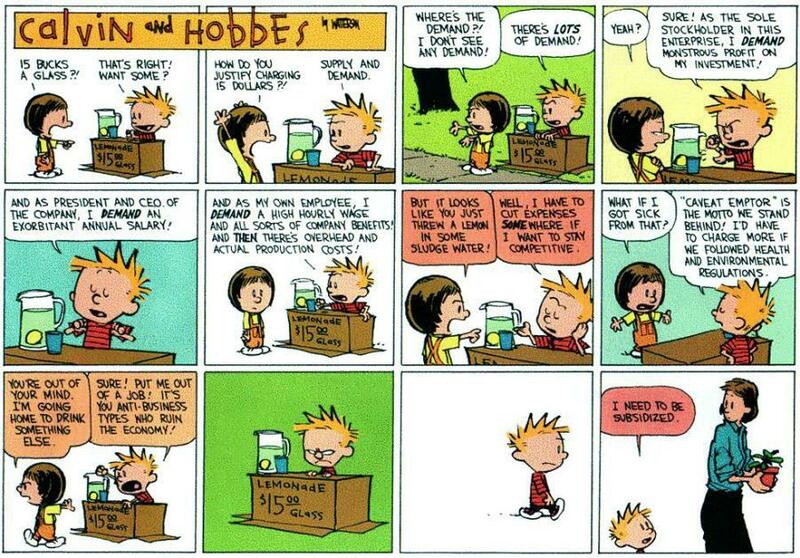 Bill Watterson had this social commentary on CEOs and big business. He is so spot on. There was recently a 20/20 or maybe it was 60 minutes, I didn't see which one, nor did I watch it, but I was told about it by a friend of mine. Basically in re-affirms our opinion about CEOs and their belief in their entitlement to EVERYTHING. Lets face it, the BIG 3 automakers well the American automakers, deliberately made decisions that have them in their current predicament. How many people are payed millions to get it wrong? In the IT world, we get it wrong, and they bounce our asses out the door. Nortel... Ship arriving too late to save a drowning company? Nortel is still alive and kicking, sort of. The former crown jewel of the Canadian Tech Sector, has never truly recovered from the .COM bust. Today they are filing for "Bankruptcy Protection" in the various countries they are operating in. The True North Strong and Free... OR NOTt! The soon to be ex-american president GW started beaking off today about US interests in the Arctic. As the legendary Northwest Passage starts coming into existence, the US is now waking up to the northern oceans. Russia has been making overtures for the last couple years because they have the largest chunk of the arctic, and they are going after the resources. America is just confused. They have one of the smallest slices of the arctic nations, but they have been less than respectful of any treaties they have negotiated with Canada. As global warming's effects become noticeable, Canada is on the global forefront of climate change. Many lives were lost exploring the Canadian Arctic for the Northwest passage. Now that the polar ice caps are melting, we now for have, for part of the year, an ice free route through the arctic ocean. This is major, because for part of the year, cargo from the orient to Europe has a shorter faster route. When the arctic ocean stayed impassable, only the nuclear subs of Russia and the US could operate in the region. Now that we are getting some snow, couple of centimeters of snow over the last few days, the graders are out cleaning the streets. Depending on the operator, the blade will be scrapping against the asphalt and creating an eerie, haunting sound, similar to whales singing. I've never personally heard a real whale song, but I have listened enough on any number of nature programs. The father took his son by the hand and led him to the fence. He said, ' You have done well, my son, but look at the holes in the fence. The fence will never be the same. When you say things in anger, they leave a scar just like this one. You can put a knife in a man and draw it out. But It won't matter how many times you say I'm sorry, the wound will still be there. A verbal wound is as bad as a physical one. Remember that friends are very rare jewels, indeed. They make you smile and encourage you to succeed. What a goofy winter, the weather is all over the map, and is reminding me of my teen years back home. A couple days at -30°C, then a couple days of 0°C, and a variety in between. I also caught some pix from Washington state where they have had weather all over the map as well. I wish the weather would settle, give me my 15' of snow stay at a nice comfortable -10°C, and keep it there until spring. Then a slow, casual melt to refill the rivers, lakes and sloughs. Keep the migratory birds, and me, happy. I'm pulling these out of the vault, the person they were originally meant for has long since left my life, so I'll put 'em here and see if they re-inspire me to get them refined.